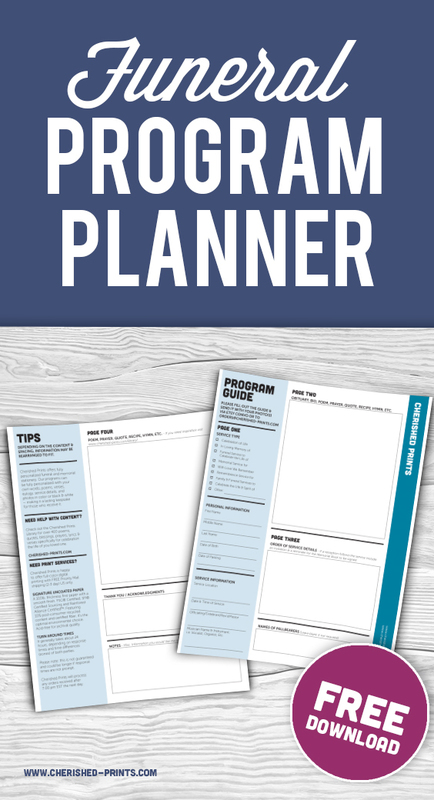 Program Guide Questionnaire: Everything Cherished Prints needs make the for your program. Below is a form to send me the information for the celebration of life program you ordered. Please make sure to upload your photos via check out (website only) or email me at orders [at] cherished-prints.com. When downloading the guide, please save it to your computer before use. The form is editable with Adobe Acrobat, Adobe Reader, or Preview and not your internet browser. The internet browser will not save the information in the form. Once you fill out the form, rename it, and save the file to your computer again. Please check to make sure the information has saved before sending. The form you can be emailed or sent to me via Etsy convo. Editable with Adobe Acrobat, Adobe Reader, or Preview.